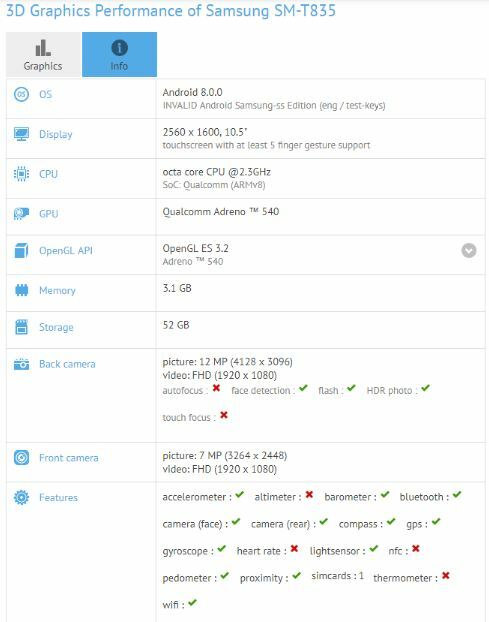 HomeNewsLeaksSamsung Galaxy Tab S4 2018 Specs and images leaked. 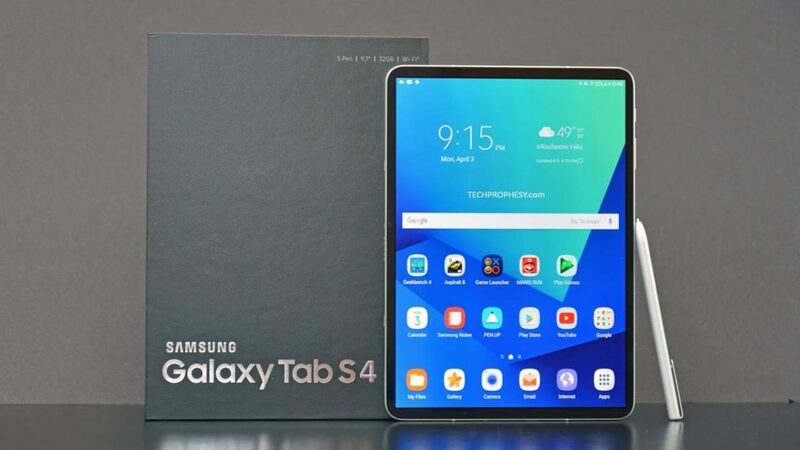 The upcoming flagship Samsung Tablet, the Galaxy Tab S4 has been leaked ahead of it’s official announcement at MWC Barcelona on 25th February 2018. So its more clear now that the Galaxy S9 and S9+ aren’t the only most anticipated Galaxies at MWC to be released in a week. The current leaks of the Galaxy Tab S4 2018 has been revealed in a current GFXBench data leaks. Showing a whole new Large display with the model number SM-T835. We already seen the Galaxy Tab S3 the T820 and it has recently been updated to the previous Android Nougat 7.0. The upcoming Galaxy Tab S4 will have the Latest Android Oreo 8.0 pre-loaded. As seen in the image below, The anticipated Tablet Galaxy Tab S4 will have a huge 10.5 inch display with an amazing 2560 x 1600 pixel resolution AMOLED diplay which will support multi touch functions. The Tablet is said to be having the current top notch processor that is found in current Galaxy S8, S8 Plus and Note 8 Flagship devices. Yes, it will be the Qualcomm Snapdragon 835 Chipset, featuring an Octa-Core 2.3 GHz processor. It is supported with state of the art Adreno 540 GPU along with 4GB of RAM. There are reports that only one variant of the tablet will be released and that would be the 64-GB internal memory variant. While there will be a microSD Card slot for a card of up to 256 GB. With these specs sheet the Galaxy Tab S4 has still quite to offer in Camera department. As the Tablet will come with a Standard 12 megapixel camera loaded with Flash and HDR+ capabilities. So one can shoot some real crisp photos with their tablets too. The front camera is supposed to be 7 megapixel Front unit which can shoot Full-HD 1080p videos. So it can be one of the best front Selfie cam or the front Video camera on any tablet. There are no reports of the Battery, but seeing at the previous tablets of the same series, we can expect that this Galaxy Tab S4 will come with at least 6,000 mAh battery. There is no clue about the price yet but it is confirmed that the device will be released on 25th February 2018 at MWC Barcelona. Keep in touch for more updates.